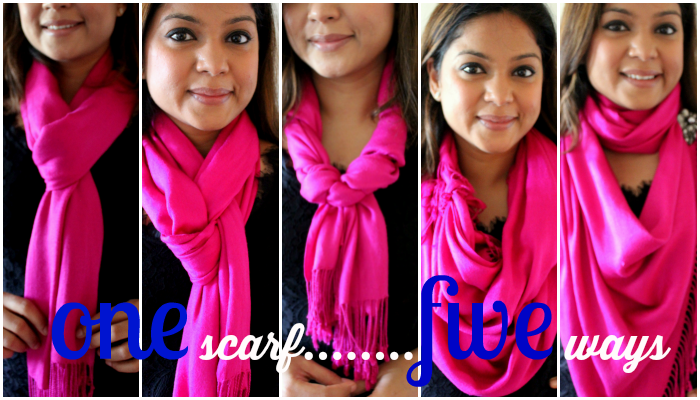 ONE SCARF, FIVE WAYS- A PICTORIAL ! Warning- This is a picture heavy post.......and it should be, it is a picture + tutorial = PICTORIAL , afterall ! 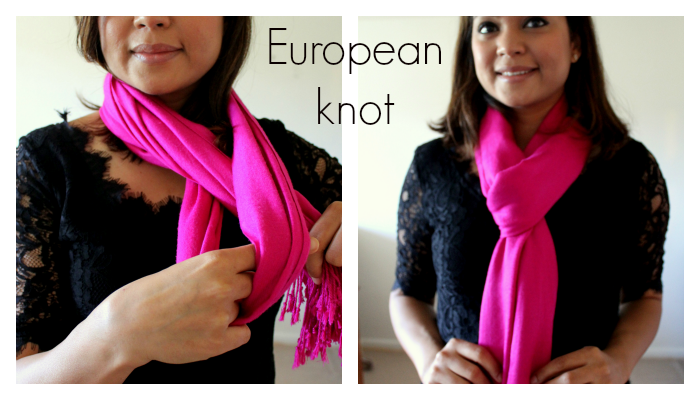 European knot- This is the most widely used style of wearing a scarf. 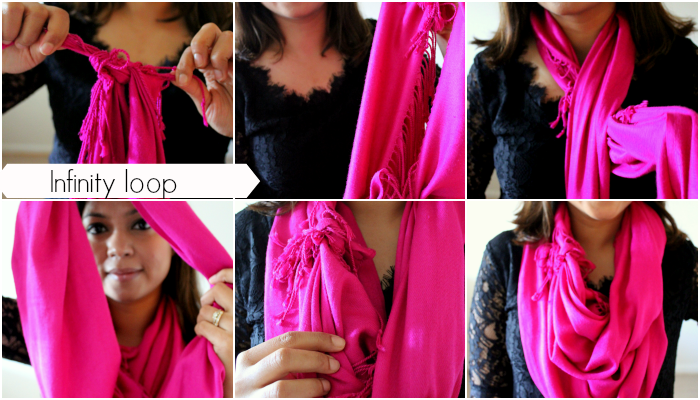 Fold the scarf in half, wrap it around your neck. Now bring the loose open end to pass through the loop and you are all set . Pretzel knot- This is a slight variation of the European knot. Fold the scarf in half, wrap it around your neck. Now take one section of the loose end and pass it through the loop, just like you would do in the European knot. Now twist the looped end of the scarf to make it look like number 8. Through this goes the other end of the scarf and you are good to go. Necklace- Hold the scarf end-to-end, wrap it around your neck taking the ends backwards. Crisscross the loose ends at the back and bring them forward . Start twisting one end around the neck loop, repeat on the other end and voila ! Infinity loop - Holding the two corners along the same edge, tie a knot. Do the same to the remaining two corners as well. 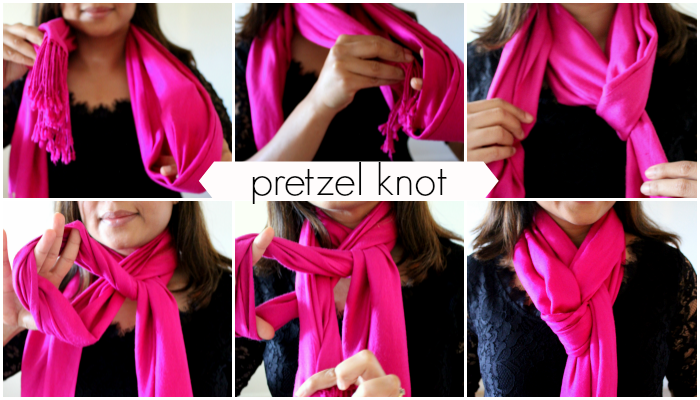 Gather the knotted ends together so that the scarf now looks like a long ring. Wrap it around your neck, twist and loop once. Adjust the placement of the knots, I like them to show in the front, it adds some interest to the look. 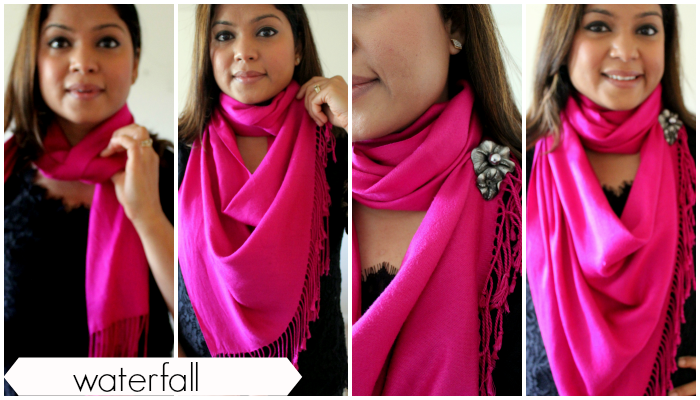 Waterfall - Hold the scarf end-to-end, wrap it around your neck taking the ends backwards. Crisscross the loose ends at the back and bring them forward in a way that one side is longer than the other. 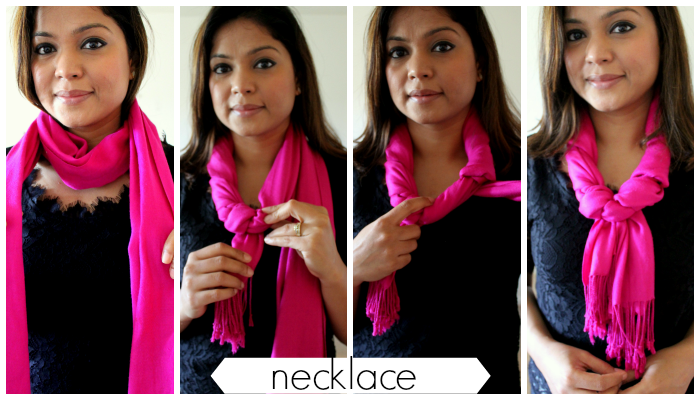 Now loop the longer end one more time or more depending on the length of your scarf. Now holding one corner of the longer side, bring it to the neck, adjust. At this point you could either tuck the corner inside the neck loops or use a brooch for your own statement look.